In the top bun students introduce/hook the reader. In the middle sections they give reasons, support, quotes, details, explanations etc, and the bottom bun gives another supportive statement that summarizes the topic sentence. Literary Elements Of Fiction Bundle: Plot, Setting, Character, Mood, Tone & More! 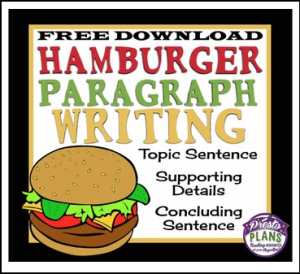 Keywords: Paragraph, Writing, Organization, Graphic Organizer, Essay.